Hire a Mazda Bongo for a roadtrip! Hire a Mazda Bongo for your next adventure! Originally starting off as a pickup truck with a cabover engine way back in 1966, this plucky campervan has risen to relative fame and has a strong fan base, especially in the UK. Sadly, production of these quirky vans came to an end in 2018, so we're afraid you will have no luck trying to get a 2019 edition. Fear not however! As their legacy and use will live on for many years, and we are of course happy to announce Mazda Bongo hire is possible right here on Goboony! The Mazda Bongo is the ideal camper for the adventurous type. With a compact design and typically four wheel drive, these Mazda campervans have been steadily gaining fame, beginning to rival that of even the T2. 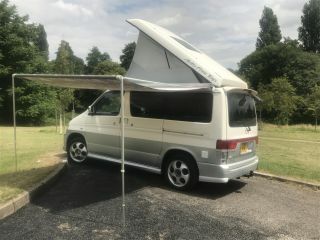 At Goboony we are proud to have Mazda Bongo vehicles for hire of all shapes sizes and ages, and we know holidaymakers will enjoy these campervans as much as we do. Alongside the Mazda Bongo, the Mazda Friendee version is also available for hire which has advantages of its own. Before conversion, the Mazda Friendee is an 8 seater minivan which really optimises space for the whole family! Want to know more? Our friends over at Bongo Buddy have a wealth of information for Bongo owners, as well as info on events and great tips if you are interested in having an adventure in a Bongo.